Americans now as likely to feel "better off" financially as "worse off"
WASHINGTON, D.C. -- Fewer Americans are now optimistic about their future personal financial situations, with 57% saying they will be better off in a year, down from 66% who said so last October. Optimism still surpasses pessimism, as 29% expect to be worse off a year from now -- although that is up from 11% who said so last fall. 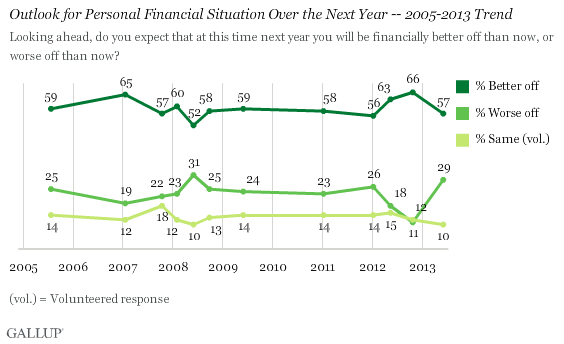 Americans' optimism about their financial future has returned to its January 2012 level, after spiking in May and October of last year during the 2012 presidential campaign. The 29% of Americans who expect to be financially worse off a year from now is the highest recorded in five years, -- although it is only slightly worse compared with January 2012. 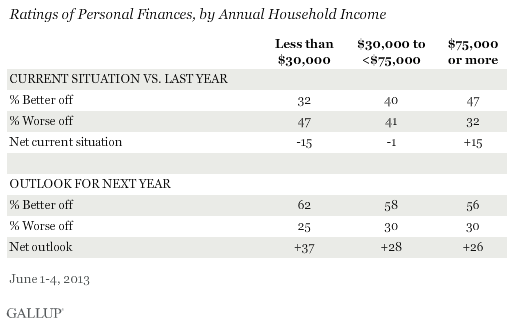 One in 10 Americans say they expect their financial situation to stay the same. 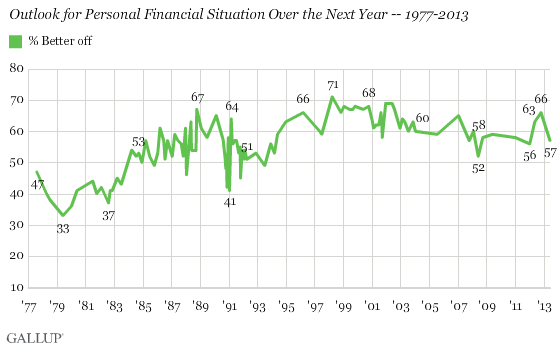 Americans' current level of financial optimism, based on a Gallup poll conducted June 1-4, is closer to the higher end than to the lower end of Gallup's full trend on the measure, dating back to 1977. The high point came in March 1998, when 71% said they would be financially better off in a year. The low point came in June 1979, when 33% expressed financial optimism for the year ahead. Americans are typically optimistic on this measure -- they have been more likely to expect their personal financial situation to get better than to get worse each time Gallup has asked the question. As is typical, Americans are more likely to say their financial situation will be better in a year than to say they are better off now compared with a year ago. Americans are now as likely to say their current financial situation is better than it was a year ago (40%) as to say it is worse (39%), with 20% saying there has been no change. Last October, Americans were slightly more likely to say their financial situation had improved (38%) rather than worsened (34%) over the past year, the first time that had happened since 2007. That year, Americans' assessments of their current financial situation climbed to 50%, but they plummeted to 23% in May 2009 -- the lowest measure in Gallup's history of this question, dating to 1976. 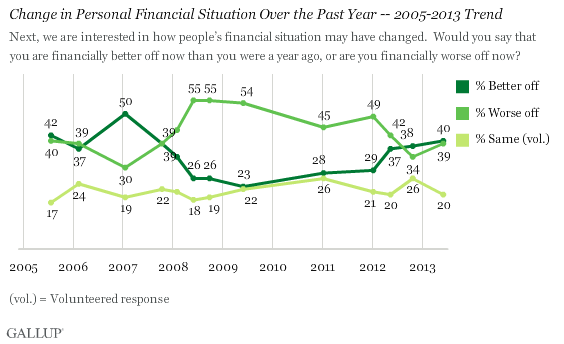 Americans' perceptions of their current financial situation have inched back up since 2009. Although Democrats, on average, have lower incomes than Republicans, they are much more likely than Republicans to assess their current and future financial situations positively. 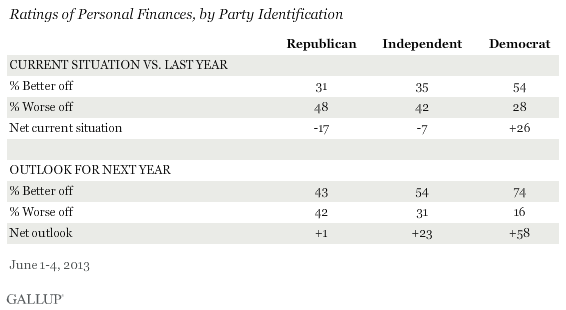 These differences by party mirror Democrats' higher levels of economic confidence, and are likely related to a Democrat's occupying the White House, suggesting the wide influence of partisanship in shaping Americans' attitudes -- because their financial situations probably do not objectively change much when a different party comes into power. High-income Americans are more positive than low-income Americans about their current financial situation. But low-income Americans' optimism about their future finances exceeds that of high-income Americans. Middle-income Americans' perceptions of their current finances fall in between those of high-income and low-income Americans, while their assessments of their financial outlook are closer to high-income Americans' views. The 40% of Americans who say their current finances are better than they were last year is higher than at any point since 2007. At the same time, Americans' optimism about their personal financial future is down from where it was in the months leading up to the 2012 presidential election. And more Americans now expect to be financially worse off a year from now than felt that way last year. This increase in Americans' financial pessimism is contrary to their improving economic confidence and standard-of-living perceptions -- which have generally been higher this year than in the previous five years. While the economy has improved in some respects, Americans may still be skeptical that indicators such as economic confidence and record-high stock values will translate into long-term economic growth. 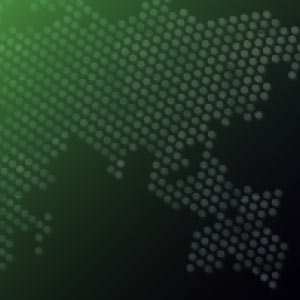 Gallup's U.S. Economic Confidence Index dipped to -7 last week from the -3 the prior week, which was the highest since Gallup began Daily tracking in 2008. The current weekly score is still one of the best in more than five years.